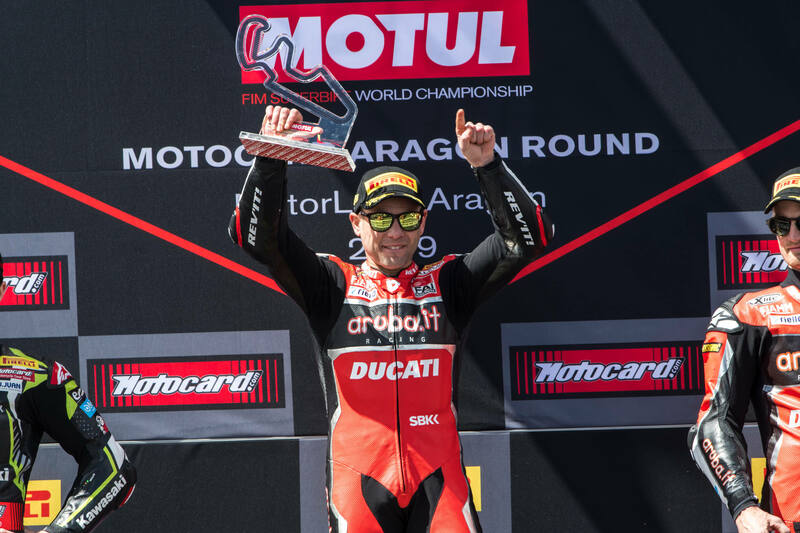 Alvaro Bautista (Ducati) continued his extraordinary dominance of the 2019 WSB championship series with another 3 wins this weekend (both of the principal races, as well as the Superpole race). That means Bautista has won all 9 races held this year during the first 3 rounds. As before, Bautista is not only winning, he is winning with sizeable gaps over second place. Speaking of second place, for the 9th time this year defending champ Jonathan Rea (Kawasaki) finished second in the final race this weekend – which means, of course, Rea would have won 9 straight races to start the year had Bautista stayed in MotoGP. Chaz Davies (Ducati) is finding his rhythm on the new V4, and he finished in third position in each of the principal races while just missing the podium in the sprint race. That’s an interesting comment, as Rea is obviously a great talent, but (just as obvious) so is Bautista. Unfortunately for Rea, Ducati decided to create an “overdog” that was fully intended to win WSBK, meeting all the sanctioning body requirements. Fact is, Ducati is just more serious about WSBK than any other manufacturer and has been so for years. The “overdog” aka Unfair Advantage is Bautista, not the bike. Actually, setting aside Bautista, the rest of the field seems closer than ever. Kinda like the good old days with Edwards, Corser, Bayliss etc. The Yamaha is strong and Sykes’ Beemer will only get faster. A lot better than flag-to-flag Rea races. Happy to see Ducati and Alvaro kicking arse and taking no prisoners. You gotta hand it to Rea. He’s like a pit bull they won’t let go of the #2 podium. During the race he’s anywhere from 2-4, but when the flag comes down he owns #2, no matter what Chaz Davies does to prevent it. I am really curious what would a race look like w/Rae and Bautista on equal rides. Ducati created an “overdog” bike that only one rider can win on? It’s obviously a good bike, but if it weren’t for Bautista, it’d be a giant flop up to this point. Even if Bautista weren’t in SBK, the V4R would not be a flop. Would you consider a brand new ground up bike getting two podiums, Chazz last weekend, in only it’s 3rd race event?? I don’t think so. Chazz has been nursing a bad back that is finally healing. His competitiveness should improve. Some bikes just suit riders. Rea and Kaw are evidence of that. Sykes and the other Kaw riders cannot compare in the same manner that all the other V4R riders aren’t as fast as Bautista. If all of the V4R’s were squashing the field like Bautista, then that would be a sure sign of “overdog”. If anything, I think the Yammy shows that it is the easiest bike to ride. There are more Yammys from different teams running up front than other brands. Someone get Syke’s BMW some top end. Cannot believe BMW would let the new RR do this badly. Also, sad to see Camier on the Honda; the MV was better. Rut- Ro here we go again. Just think, without Bautista, Rea would be kicking every one’s but once again with 9 straight wins, and people would be saying how boring WSBK is.